Chashnik has been a target for fakers and fraudsters because he died young when Soviet artists were isolated by the politics of the Soviet art world, the anti-Soviet alliance in Europe and the US, and by approaching world war. Lack of a reliable catalogue of Chashnik’s surviving works did not appear until his son, Ilya Ilyich, assisted in mounting a retrospective exhibition in New York in 1979. He too is dead. For more on the artist (below, left), with illustrations, read this. One of the notable collectors of this Russian and Soviet art was George Costakis (above, right), a Greek who spent most of his life working in Moscow. The story of how he collected the artworks now known by his name and on display in the state art museums of both Russia and Greece can be read here. There are two collections; neither of them sells Chashnik’s works. The collection Costakis took to Greece in 1977 has been installed in Thessaloniki, where it can be viewed here. Still, by comparison with others who outlived him, Chashnik was, and still is, a relative unknown. That contributes to the rarity of his works, and to the high price they have begun to command if they are genuine. Chashnik’s obscurity also contributes to the ease with which his work can be forged and buyers defrauded. In the Tajan catalogue for an auction of modern art on March 8, two works of Chashnik were offered for sale. One of them, an oil, had never been known to exist before, and carried no date of origin or chain of pownership or provenance. It was put on the block with an estimated price range of €18,000 and €20,000. 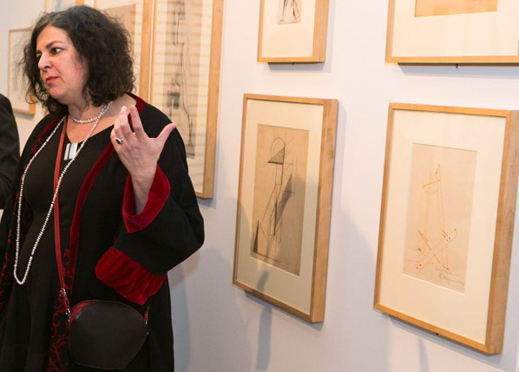 The drawing (see lead image) was estimated by Cohn and the Tajan sales management in the range of €12,000 and €15,000. The story of the oil, and of the bigger business of falshak, can be read in this report of earlier this week. 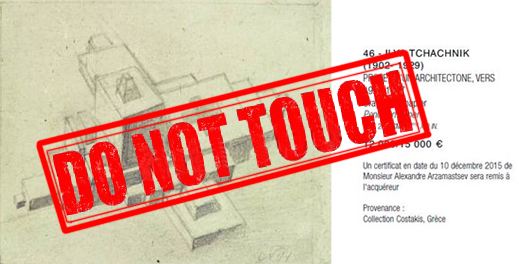 According to Tajan’s publication of the auction results, neither Chashnik work, Lots 46 and 47, sold. That was on March 8. On April 12, Cohn (below, left) emailed to say: ‘these artworks have been sold on March, the 8th. We don’t have any other artworks by this artist for the moment.” Cohn and the supervising director of the specialist departments at Tajan, Jean-Jacques Wattel (right), have declined several requests to clarify what happened to the Chashnik works. Experts on Chashnik’s circle of artists and on Chashnik himself, reading the report on Russian falshak this week, have responded that they doubt the authenticity of both Chashnik pieces. If they were genuine, said one, they were being priced too cheaply. The authenticating expert for the Chashnik works cited by Tajan, Alexandre Arzamastsev, is not known in Moscow, according to art market sources. Arzamastsev has refused to respond to questions to identify himself, clarify his expertise, and confirm the published claims about the Chashniks. In Thessaloniki, Maria Tsantsanoglou is the director of the State Museum of Contemporary Art. Educated at the Moscow Lomonosov University and an expert on Russian futurism and Russian avant-garde of the early 20th century, she says the forgery of the avant-garde painters is “a painful story”. In fact, the Chashnik drawing is still on the Tajan website, attributed to the Costakis Collection, and certified by Arzamastsev. Ahead of publication this morning Paris time, Wattel and Cohn were asked “to explain the circumstances of the false provenance and what appears to be the false certificate by your expert, Mr Arzamastsev.” They have not answered.